The mountain biking in and around Turkey Point is some of the best trail riding in Ontario. 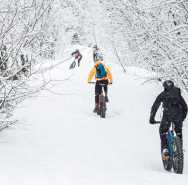 There is over 50km of single track trail that includes trails along 100′ deep cut ridges adjacent to the World Biosphere Reserve and through both Turkey Point Provincial Park and St. Williams Conservation Reserve as well as adjacent lands including a meandering trail through the award-winning Burning Kiln Winery and its vineyards. We will guide you through the plethora of trails in and around the area. Tours will consist of participants ranging in age and experience level and must be arranged at least 2 days in advance. Rental bike & helmet available for an additional $25/person. There is a 2 hour tour, and a 6 hour tour.